Central Armed Police Forces, Is Appointing Eligible People To The Various Medical Officers In Following Para Military Forces (ITBP, BSF, CRPF, SSB and Assam Rifles). So Interested Male And Female Can Apply For This Job Through Online Mode Within The Given Time Period. 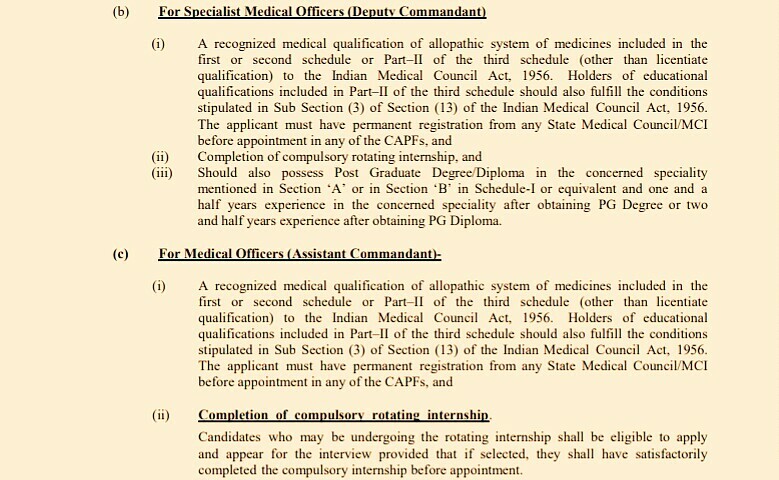 Medical Officers (Assistant Commandant)→317 Vacancies. Specialist Medical Officers (Deputy Commandant)→175 Vacancies. Super Specialist Medical Officers(Second-in-Command)→04 Vacancies. Total Number Of Vacancies →496 Online Vacancies, Kindly Do Check Out The Images Below For Educational Qualifications. B. 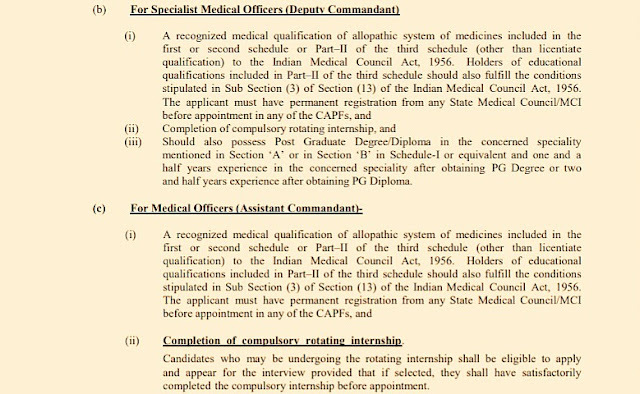 Eligible Criteria For Medical Officers Job Vacancy In CAPF Recruitment 2019. Age Limit →The age limit for recruitment of Super Specialist Medical Officers (Second-in-Command) should not be exceeding 50 years as on the closing date of receipt of application. (ii) The age limit for recruitment of Specialist Medical Officers (Deputy Commandant) should not be exceeding 40 years as on the closing date of receipt of application. (iii) The age limit for recruitment of Medical Officers (Assistant Commandant) should not be exceeding 30 years as on the closing date of receipt of application. Mode Of Examination/Selection Process →Interview/Medical Tests. Online Application/Examination Fee →Male candidates belonging to General (UR)/OBC category applying for recruitment to the above posts should pay Rs 400/- (Rupees Four Hundred only) as application fee through online payment gateway system on www.recruitment.itbpolice.nic.in. Application received with any other mode of fee payment will be summarily rejected. Candidates belonging to Scheduled Caste, Scheduled Tribe, Ex-Servicemen and Females are exempted from paying the fee. Fee once paid will not be refunded under any circumstances. Fee paid by modes other than above will not be accepted and the applications of such candidate will be rejected forthright and the payment made shall stand forfeited. Last Date For Online Application Form Submission →01st Of May, 2019. Now Apply For ITBP Recruitment 2019.